First Shot FREE! SELECT A CLASS ON THE TIMETABLE BELOW AND FOLLOW THE INSTRUCTIONS. PLEASE NOTE: ONE FREE CLASS PER PERSON - if you can't book your class, it may be full so please choose another session. Our classes are high intensity and high impact while catering to all fitness levels. As your technique improves, so will your ability to train harder. If you plan on attending our boxing classes regularly, it is highly recommended that you purchase your own boxing gloves. We sell a great range at Body Shot Fitness and also give you the option to try a pair before you buy. Nervous about diving into your first class? This session is perfect for beginners and will help you maximise the benefits of your classes. Learn the boxing basics in a 1 on 1 training session including stance, punches, pad work and hand wrapping. *For purchase one time only. This is our trademark boxing class. 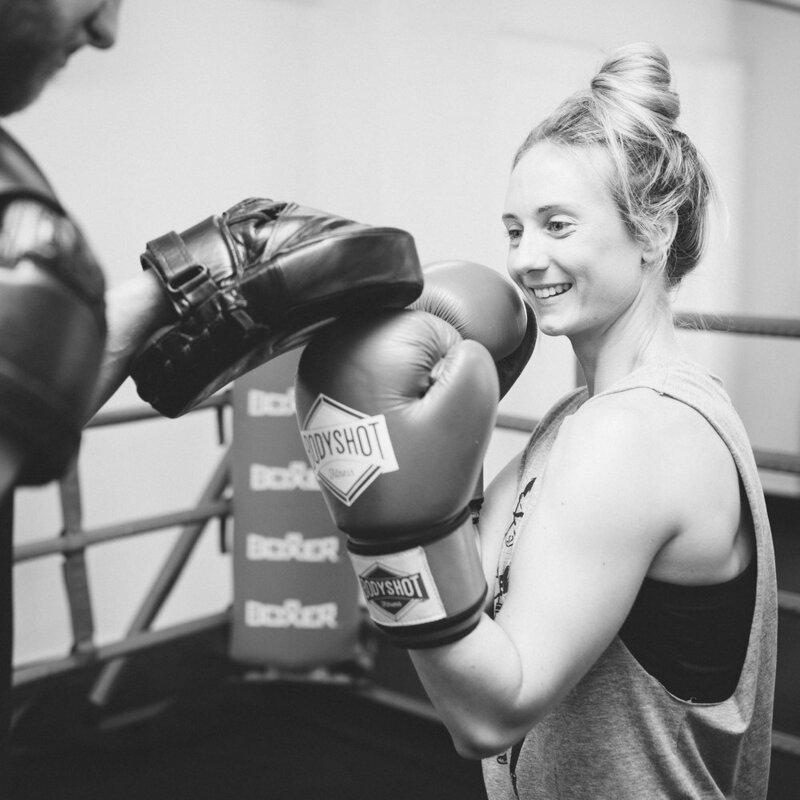 High intensity boxing in a fun and motivating team environment. We combine bag and pad work with fight specific fitness drills. It's safe! The only thing in danger of getting beat up will be the bags, pads and calories. Equipment needed: boxing gloves, hand wraps. (Gloves provided free for first shot). Becoming fighting fit isn't just about striking. The gloves are literally off in this action-packed strength and conditioning class. We use specialised cross training exercises in a circuit format to add fun variation to your routine. We use kicking techniques and fitness drills from a mix of martial arts to create an exciting workout that challenges your lungs, legs and core like never before. Equipment needed: comfy shorts/trackies and lightweight shoes or no shoes. A more technical boxing session than Body Shot. We break down and clean up technique using partner focus pad and glove drills. We will not be on the bags but you will still get a great workout. Equipment needed: boxing gloves, hand wraps. We take on Wellington's stairs and hills in short burst running (or walking) intervals. We use this class to help prepare for team fitness events. You need to be able to run injury free to join in. This class is for all fitness levels and running speeds. Equipment needed: good running/walking shoes. mental strength and get you out of your comfort zone. Please note you must apply to join this class and there are no free trials.